American podcast Blamo! recently featured an interview with me, which you might enjoy listening to. Founded by ex-Armoury man Jeremy Kirkland, it interviews both fashion and music innovators to talk about their experiences. Previous interviewees have included Nick Sullivan, Josh Peskowitz and Michael Bastian. Jeremy and I cover the ethos of Permanent Style, suit constructions, and why no magazines are helping men dress well. You can listen to the episode on the Blamo! website, or on iTunes and any other podcast service. 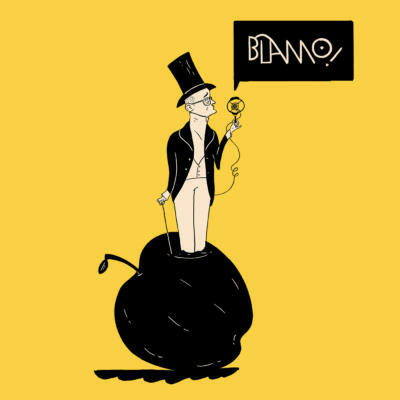 You can follow the discussion on Blamo! by entering your email address in the box below. You will then receive an email every time a new comment is added. These will also contain a link to a page where you can stop the alerts, and remove all of your related data from the site. Great content as usual, however it was difficult to listen to so many upward inflections at the end of sentences. iron maiden t-shirts and purple Doc Martins – really? Surely you should be using the ox blood Doc Martins to tone in with Iron Maiden. I also think I bought the same light grey suit pin strip suit from Zara – imagine the joy of owning something that the great Simon Crompton owned only to find out that he thought it was rubbish. Crushed. But as ever you were right it was terrible. Entertaining and informative podcast – thanks. Simon you say that no mags are helping men dress well – not the Rake which you work for? Simon, do you write freelance? So if we wanted to do a monthly “how-to” blog, is it something that you’d consider? Hi Matt, yes I do freelance work for the Financial Times, Robb Report, Rake and so on. I’m happy to consider it, although my time is a bit limited for freelance at the moment. Send me an email and we can discuss. The Rake has a habit of confusing ‘well-dressed’ with ‘expensively dressed’. Flick through the average issue and you could be forgiven for thinking that one needs a six or seven figure income and bespoke everything in order to be well-attired. Very enjoyable podcast, Simon. Great backstory on how the blog came about. Nodded my head throughout the discussion about men’s style magazines, which reminded me of a line from J. Press about–I’m paraphrasing–how their clothes won’t embarrass you when you’re going through those wedding photos ten years from now. Best of luck with the book. More of the same wouldn’t go amiss, very enjoyable listening. Thank you. Are there any other men’s style/fashion podcasts you are aware of and would recommend? It was great to put a voice to the words I read. For me the most interesting part of the podcast was when you mentioned the ‘city suit’, or the suits that the finance guys wear, which take way more of beating. Do you think you could write about this some more and put together a list of these tailor? I noticed the that no answer was given Jeremy’s question about what RTW you support, if any. Do you find any worth mentioning? Graham Browne and Choppin & Lodge are the ones I have written about in the past on the blog – have a look at those. It’s more of a tradition that used to exist, but there is little of it anymore. There are only a few left. Yes, there is certainly some RTW I like, but that’s a big question that will need a lot of space to answer – eg there are many I like for style, less for quality, or for value for money etc.